The key to understanding the evolving role of VoIP is recognizing that it’s a lot more than just another method for making voice calls. Buying VoIP means more than simply replacing your existing phone system with a functionally identical one running over an IP network. In fact, the underlying IP technology makes possible great advances in the convenience and capabilities of phone systems. Most important of these is that it allows the integration of voice calling with multiple other methods of communication. Both sellers and buyers of VoIP products that build their strategies around this reality will fare best. Unsurprisingly, most leading providers are moving in this direction. On the equipment side, these include august names like Avaya, Cisco and ShoreTel. On the hosted services side, they include BroadSoft, Fonality and 8x8 (though Fonality actually plays on both sides). 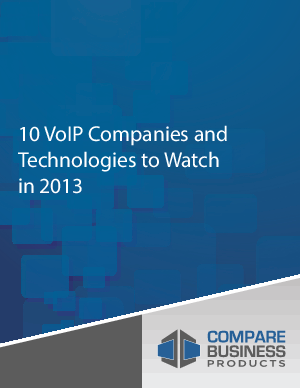 This document identifies 10 companies and technologies to watch in 2013. Each of them illustrates some aspect of VoIP business and technology that will affect companies using or considering using VoIP in the near future. And in many if not most cases, their integration of VoIP with other communication methods is in large part what makes them worth watching.